5 in 1 toaster with extra wide toasting slots. Product size: L: 38cm H: 20cm W: 16cm - frying pan size: W: 14cm L: 11cm D: 2cm. 1250W - 66cm power cable - made from rust resistant stainless steel. If you are not available to accept your parcel, the carrier may leave it with a neighbour or in a safe location, if they think it is safe to do so. During use, the defrost, reheat and cancel functions are illuminated, making for quick and easy use. We reserve the right to refuse service to anyone. The Igenix IG3012 2-slice toaster is ideal for those who like to enjoy a diverse range of bread choices. Bread Guide with Self Centering Deep Slots. Plug Adapter not supplied. UK Plug - This item is fitted with a Type G 3 Pin plug type. Cutting & Slicing. Cuisinart 4 Slice Toaster Brushed Stainless Steel Ref: CPT445UCuisinart 4 Slice Toaster. This stylish stainless steel toaster has extra deep, extra wide toasting slots which are perfect for all types of breads and bagels. Curve Collection 4-Slot Toaster Features at a Glance Fully removable crumb tray for easy clean. 4 slot 4 slice capacity. Features high shine accents. Mid-cycle cancel. Non-slip base. 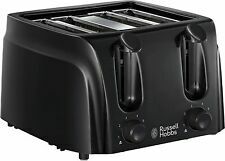 Russell Hobbs Westminster 1500W 4 Slice Wide Slot Toaster - Black. It also has wider slots to accommodate thicker slices - ideal for toasting crumpets, tea cakes & even fit larger bread slices. Then, when it’s done, the High Lift function lifts the bread out of the slots so you can remove it comfortably and safely without having to touch hot slots. Morphy Richards Accents 4 Slice Wide Slot Toaster In Black Variable Width 242031. Morphy Richards Equip 2 Slice Toaster 850W Brushed Stainless Steel 222055. Removable crumb trays allow you to easily clean your toaster. 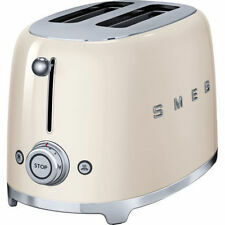 This toaster also has defrost, cancel and reheat settings and has a high lift facility. Other features include non-slip feet and a removable crumb tray. 4indoors provides a standard one year warranty on all of our products. • Automatic bread centring for even toasting. • Electronic sensor for even toasting results. • Removable crumb tray for easy cleaning. They have been checked, inspected, repaired (if necessary), graded and reboxed (if necessary) complete with all accessories. 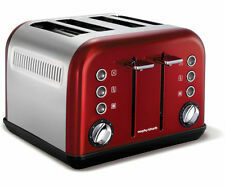 Morphy Richards Evoke Red 4 Slice Toaster Wide Slot 240108. Evoke a reaction, create a new identity and add a touch of elegance to your kitchen with the evoke collection. 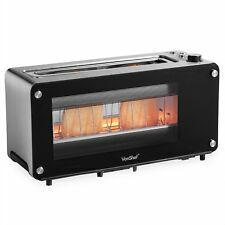 Morphy Richards Accents 4 Slice Wide Slot Toaster In Black Variable Width 242031. Easy removable crumb tray. 2 Deep variable width toasting slots for thick and thin bread. Defrost setting. Mid cycle cancel button. BREVILLE Impressions VTT470 4-Slice Toaster White - BRAND NEW IN BOX & RECEIPT! BREVILLE Impressions VTT470 4-Slice Toaster - White Curry's Condition is New in box with receipt Received as a Christmas present but not needed. COLLECTION IN PERSON ONLY!!! 5 out of 5 stars - BREVILLE Impressions VTT470 4-Slice Toaster White - BRAND NEW IN BOX & RECEIPT! 44 product ratings44 product ratings - BREVILLE Impressions VTT470 4-Slice Toaster White - BRAND NEW IN BOX & RECEIPT! We all have it - that perfect shade we want our toast to pop out like. Whether you want it lightly done or nearly black, with this grey Cookworks toaster, you can achieve that ideal level of toasty-ness, just to your liking! DEFROST, REHEAT AND CANCEL FUNCTIONS. MULTI FUNCTION TOASTER WITH AUTOMATIC SHUT OFF. AN AUTOMATIC SHUT OFF AND EXTRA LIFT MAKING IT EASY TO COLLECT YOUR TOAST WHEN IT'S DONE. STAINLESS STEEL & GLASS. 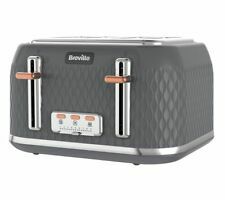 BREVILLE VTT912 Curve Cube Wide Slot 4 Slice Toaster In Grey and Rose Gold. Eye-catching on any kitchen countertop, the BrevilleCurve VTT912 4-Slice Toaster is both stylish and functional. - High-lift facility makes it easy to remove smaller slices. • Material: Plastic Colour: White. • Lift and Look function - check the toast for serving. • High Lift - helping you to reach small slices of bread. Curve Collection 4-Slot Toaster Features at a Glance 4 slot 4 slice capacity. Features high shine accents. Non-slip base. Extra high life for easy toast removal. Fully removable crumb tray for easy clean. 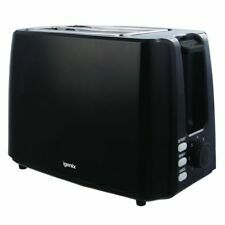 ThisBlack 1300W 4-Slice Toaster with 7 Browning Settings features cool touch construction for safety in the kitchen. Slide out crumb tray. Colour: Black. Cool touch. Fitted with BS approved 3 pin UK plug. Morphy Richards Equip Jug Kettle 1.7 Litre 3000W Brushed Stainless Steel 102773. Morphy Richards Redefine Illuminated Glass Jug Kettle 1.5 Litre 108000. 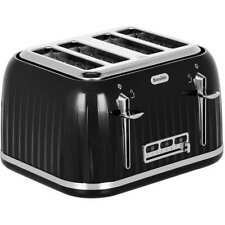 Morphy Richards Accents 4 Slice Wide Slot Toaster In Black Variable Width 242031. Impressions 4 Slice Toaster. Eye-catching ridged texture design with a high gloss finish. Variable width bread slots for thick and thin slices. Defrost / reheat and mid-cycle cancel functions. Removable crumb trays for easy cleaning. Eye-catching on any kitchen countertop, the Breville Curve VTT786 4-Slice Toaster is both stylish and functional. The VTT786 features a removable crumb tray that makes cleaning easy. - Contemporary design looks great on any kitchen counter. 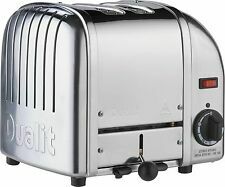 Toaster 4 Slice BT-410. High Quality 4 SLICE TOASTER. Ideal for house use/Normal size bread only. STEELNESS STEEL HOUSING. WEIGHT: 1.2KG. Size of slot: L130xW30xH115mm. Power: 1300W, AC 220-240V, 50/60Hz. 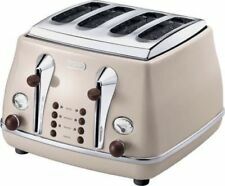 The toaster also boasts a defrost function, which lets you toast your bread directly from the freezer. The toaster is complete with a removable crumb tray, for easy cleaning, variable width slots, to fit all different types of bread, and a high-lift function, which gives you easy access to your bread once it is done toasting. Hamilton Beach Keep Warm 2-Slice Toaster Extra Wide Slots! This compact appliance is a popular and handy item for any kitchen. Loved by the whole family, the toaster takes pride of place on the kitchen worktop. There is a wide selection of toasters available to match a variety of interior and kitchen decor with popular colours including silver, white and black. You'll find a variety of new and refurbished toasters from top brands including Breville, Swan and Morphy Richards plus many others. Many new toasters also come with warranties and set up guides for easy use. For people that love toast or have several mouths to feed at breakfast time, there is a selection of toasters for all family sizes. Popular toasters include 2 slice sections whilst others include 4 and 6 slice compartments for toasting several slices at once. If you're looking for a toaster that has other exciting features, many models have a range of functions that make breakfast simple and fast. Classic toasters feature traditional cooking elements with variable browning controls, reheat and defrost settings plus mid cycle cancel options to toast just how you like it. Some toasters also have LED lights and easy clean crumb trays to keep the mess to a minimum. 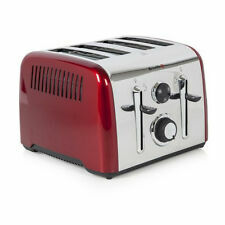 If toasting your favourite bread wasn't enough, some toaster models include handy extras to cook a range of things whilst your bread is browning. A popular example is an egg cooker which is attached to the side of the appliance. This compartment cooks one egg perfectly whilst you prepare your toast and offers a fast and easy ways to have sunny side eggs on toast. Many models also give the choice of fried, poached or boiled eggs so you can choose your favourite for breakfast. Other handy gadgets include a warming rack above the slice compartment to heat up pastries and buns.